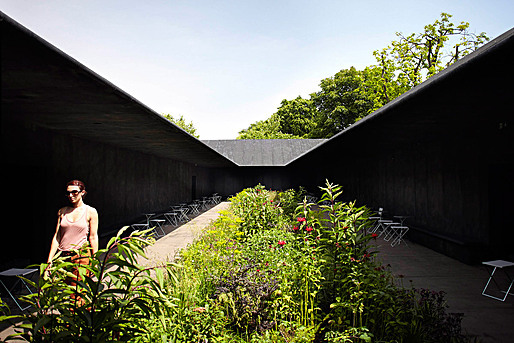 Swiss architect Peter Zumthor’s Serpentine Gallery Pavilion 2011 (Showed above) – a rectangular black box enclosing a garden in the middle – remained me of the Chinese character “Yuan” 園 for garden. 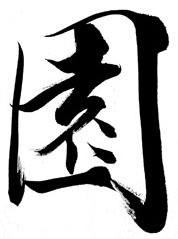 The character for “Yuan” (showed below), is enclosed by a wall, with the phonetic radical “yuan” in the middle, which is not only a phonetic symbol but also expressed the essence of a Chinese garden, it is made of “earth/soil” (“tu” 土) at the top to grow flowers, shrubs and trees, has a “mouth” (“kou” 口) in the middle to represent openings to express the idea of framed views and borrowed views used in a garden and “female” (“nu” 女) at the bottom to represent the garden being a Yin place – a quiet retreat from the outside world. Peter Zumthors does a masterpiece of Qing-Dan 清淡 (simple and elegant) architecture again with this pavilion and reduced a garden right down to its Benxing 本性 (original character or essence) just like what the Chinese character for garden tried to express. Thanks for your kind words, by all means please quote me if it is useful for your thesis and good luck to your study.